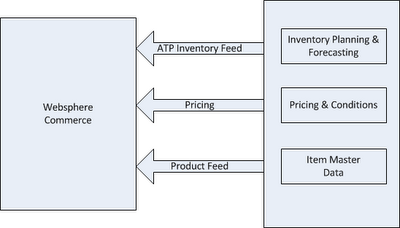 Websphere commerce--ERP data flow !! For a lot of front end developers not working on integration, the ERP system is like a Black hole. This blog presents high level flow and integration touch points. As a part of most B2B and B2C implementation, it is generally important to communicate with a back end ERP system. The core of order management system in ERP has at least 3 main documents, Sales Order Doc, Delivery Doc, Invoice Doc. Sales Doc is used to create orders, delivery doc involves with shipping, Invoice with PO and settlement. 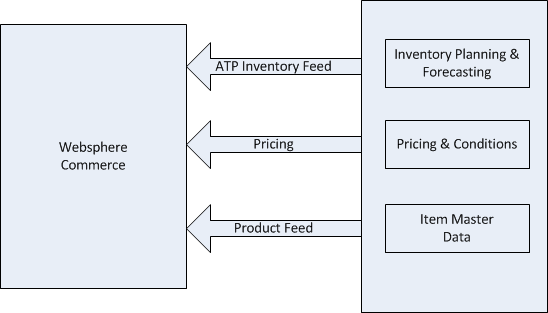 There could several other feeds and integration's depending on the operations in the end ERP system but most e-commerce system are fed Product\Pricing\Inventory data from back-end. All this data being transported between the systems, could be implemented as Feeds\Web services\JMS-MQ . Enterprise middle-ware systems such as Web Methods\WebSphere ESB\Open Source ESB could be for data transformations and communication with multiple systems. If the orders are dropped into the ERP system for order fulfillment at the high level, order tunnel flow from commerce to the backend system.